Memorial Cave is a small cave southeast of the Imperial City containing vampires (quest-related). It contains only one zone, Memorial Cave. This cave contains 13 Cairn Bolete plants and 15 Wisp Stalk plants. 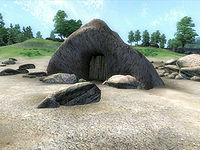 If you decide to let Roland Jenseric live, Seridur will be found here during the related quest. 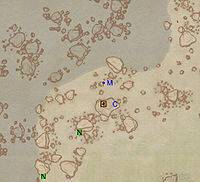 This location's map marker (M on map) is named Memorial Cave (editor name MemorialCaveMapMarker). The entrance door is S of the marker, 40 feet away. The primary use for this cave is as part of the quest "The Order of the Virtuous Blood", but Phintias of the First Edition gives a little extra background on the cave's history. There are two paths to take you deeper into the cave once you reach the first enemy. 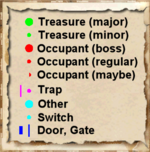 Going straight ahead leads to a few enemies and minor loot chests, while taking a left leads to the majority of enemies in the cave, but also to the dead captive (C) and boss chest (B). 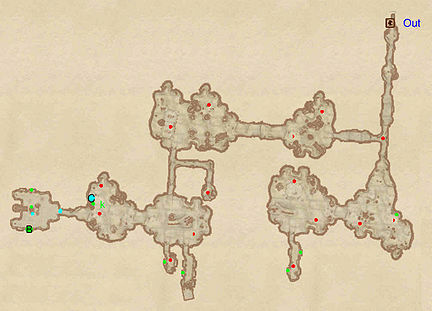 The small light blue dots on the map near (B) are ropes dangling from the ceiling with skulls attached. Seridur also appears near (B) if you decide to spare Roland during the aforementioned quest. The unnamed key at location k doesn't open anything. 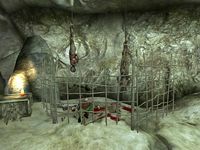 This issue has been addressed by the Unofficial Oblivion Patch; it is renamed to "Memorial Cave Key" and opens the locks of the gate to the victim pen at location C, the boss-level coffin at location B, and a chest marked only by a green dot on the eastern side of the map. This page was last modified on 27 March 2019, at 09:03.